Setting new benchmarks for design, quality and technology, the all-new Mercedes-Benz A-Class is a family hatchback with a difference. Looking to build on the huge sales success of its predecessor, Mercedes-Benz have left no stone unturned in the development of this 3rd generation model. With a stylish, sleek and ultra-modern look, the new A-Class is tasked with the job of stealing sales from rival brands, along with building on its own loyal customer base. Sitting on a revised platform, the new A-Class looks different to its predecessor in every way and is now one of the most distinctive cars in its class. The new A-Class is 100kg lighter than the car it replaces, making the car more economical and sharper to drive as a result. The interior of the new A-Class is unrecognizable from the 2nd generation model too. Every model has digital dials and a pair of wide central, high-resolution, touchscreens as standard – behind which is state-of-the-art technology. The screens are super-easy to operate using the steering wheel, touchpad or touchscreen. The latter represents a world-first that is definitely worthy of praise. Amazingly, the software used is even more advanced than that found in Mercedes-Benz’s flagship car, the S-Class. The cabin of the new A-Class consists of a combination of high quality aluminium, plastics, wood and leather, which infuses the car with an air of luxury befitting of the Mercedes-Benz brand. Mercedes-Benz User Experience (MBUX) is standard on all A-Class models and it features the voice-activated ‘Hey Mercedes’ system, allowing you to adjust the climate control, make a phone call or even ask for the weather forecast without taking your hands off the wheel. With the A-Class ‘Human Centred Interface’ you can adapt every detail to exactly your demands, driving style and needs. Just one simple swipe of the touchpad, steering wheel or touchscreen is all that is required. With the touchpad you can control the information shown on the media display intuitively like on a smartphone. Shift or enlarge the content quite simply with multi-finger gestures. Each input is confirmed with haptic feedback. The touchpad recognises your handwriting should you wish to enter addresses or phone numbers silently. 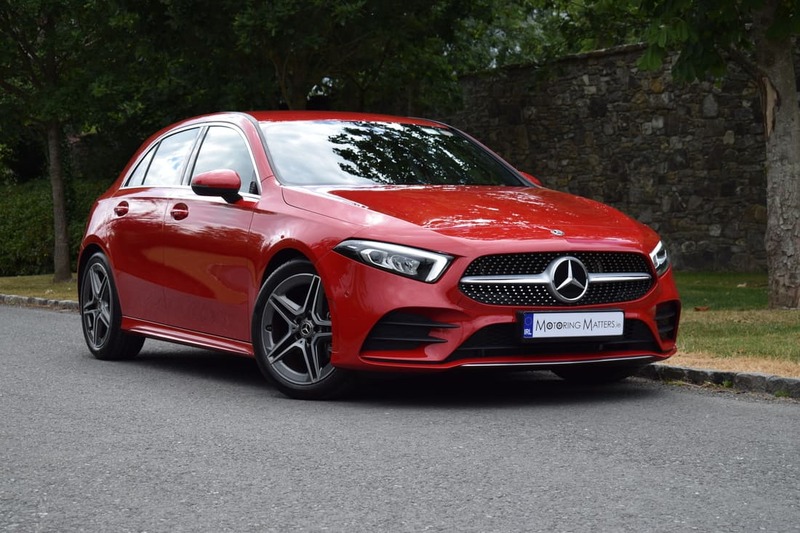 The new Mercedes-Benz A-Class is available in a choice of three trim levels – Style, Progressive and, range-topping AMG Line, while engine options consist of a 1.33-litre petrol engine (badged A200, with 163bhp) and a 1.5-litre turbo diesel (badged A180d, with 116bhp). Mercedes-Benz intend adding more engine options to the line-up during 2019. The new A-Class platform has been designed with electrification in mind, so we can expect to see an electric A-Class derivative in the not to distant future too. 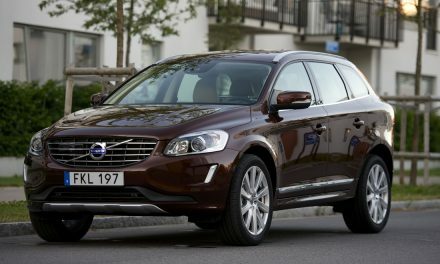 All diesel models are fitted with a 7-speed automatic gearbox, while petrol models have 6-speed manual or 7-speed automatic options. 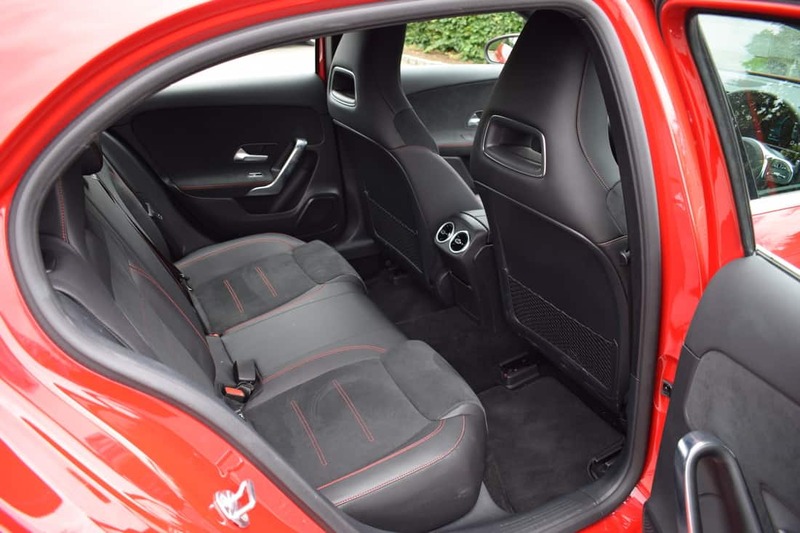 My test car was a super-stylish Mercedes-Benz A180d AMG Line Automatic finished in stunning Jupiter Red (non-metallic) paintwork. Courtesy of a 1461cc turbo-diesel engine with 116bhp and 260Nm of torque, the 0-100km/h sprint can be completed in just 10.5 seconds – on the way to a top speed of 202km/h (where permitted). 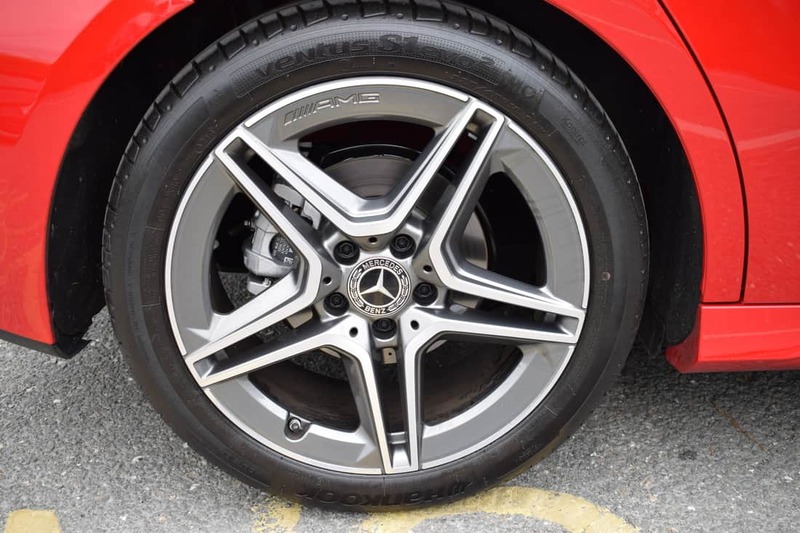 Standard AMG Line specification includes 18” AMG 5 x twin-spoke light alloy wheels, 3-spoke multifunction sports steering wheel in nappa leather with flattened bottom section, AMG body-styling consisting of an AMG front apron with front splitter in chrome, AMG side sill panels, AMG rear apron with chrome trim and visible exhaust tailpipes, AMG sports pedals in brushed stainless steel with rubber studs, chrome plated beltline and window trim strips, diamond radiator grille with chrome pins and single louvre, ‘Direct Steer’ system, double cup holder, ’DYNAMIC SELECT’, folding armrest, front brake calipers with Mercedes-Benz logo, heated front seats, LED high performance headlamps, ‘Light & Sight’ package, lowered comfort suspension, MBUX multimedia system, split-folding rear seats, reversing camera, black fabric roof liner, sports seats, ‘THERMOTRONIC’ automatic climate control and many other luxury and safety features. 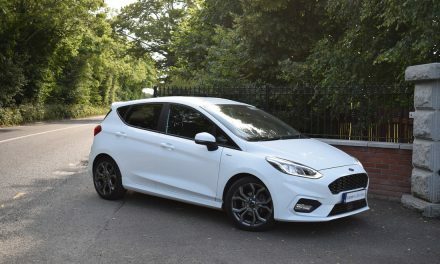 Optional extras fitted to my test car consisted of an ‘Advantage Package’ (Parking Package, Mirror Package, Satellite Navigation with a 10.25-inch display) and ‘Speed Limit Assist’ – priced at €2,927 and €471 respectively. Driving dynamics in the new A-Class are excellent, with minimal body roll through corners, light steering for precise directional control and a strong brake pedal response for ultimate braking confidence. 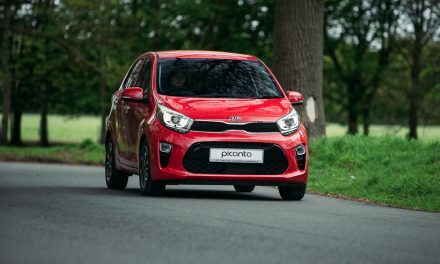 The slick-shifting seven-speed DCT (automatic) gearbox responds very well to changes in acceleration or deceleration, while shift paddles located behind the steering wheel allows the driver to change up, or down, quicker if the need arises. 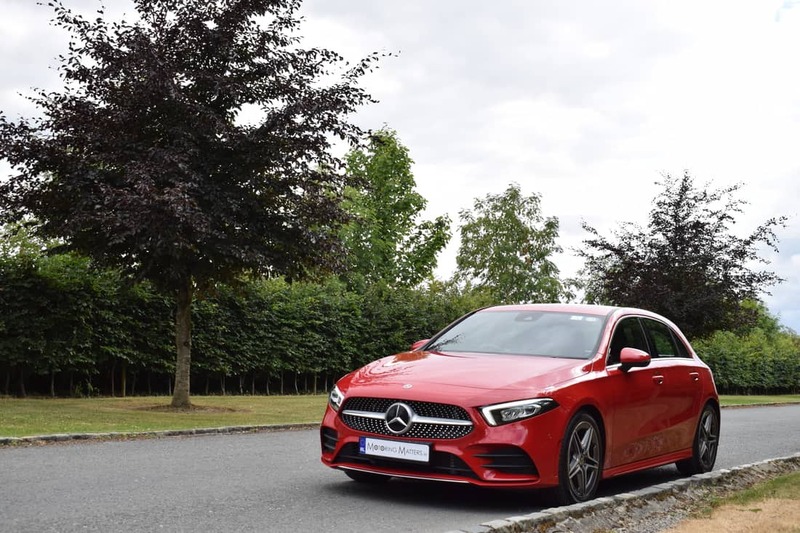 Fuel economy is yet another feature of the new A-Class that impresses, with as little as 4.1-litres of diesel being consumed for every 100km driven on a combined driving cycle. Low emissions of 111g/km, means that annual road tax is just €200 in diesel engine guise with the standard automatic gearbox. 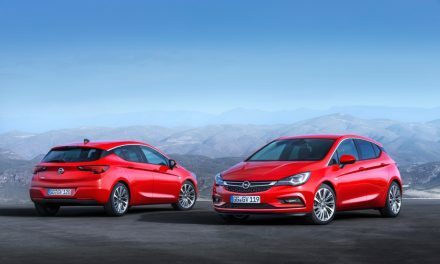 Road tax for the petrol engine models range from €200-€280 depending on the model and transmission chosen. 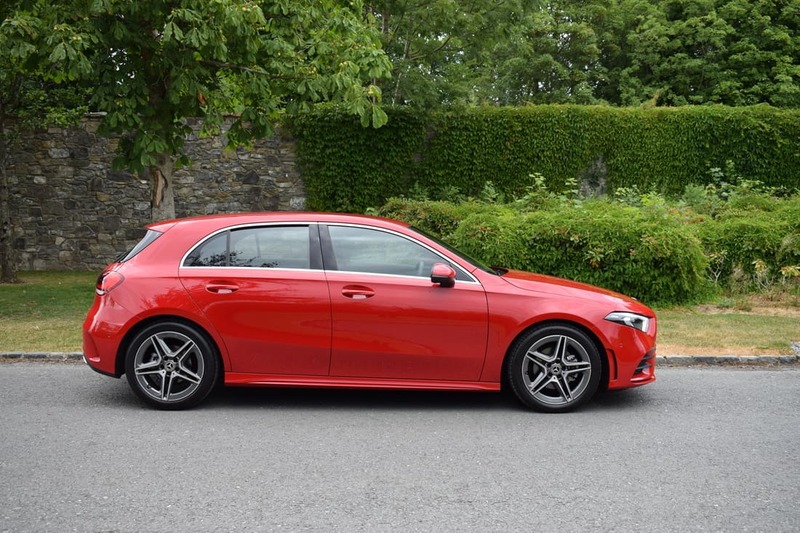 Bosses at Mercedes-Benz claim that the new A-Class offers ‘C-Class levels of comfort’ and I can deem this assertion to be true after spending some time behind the wheel of my test car. 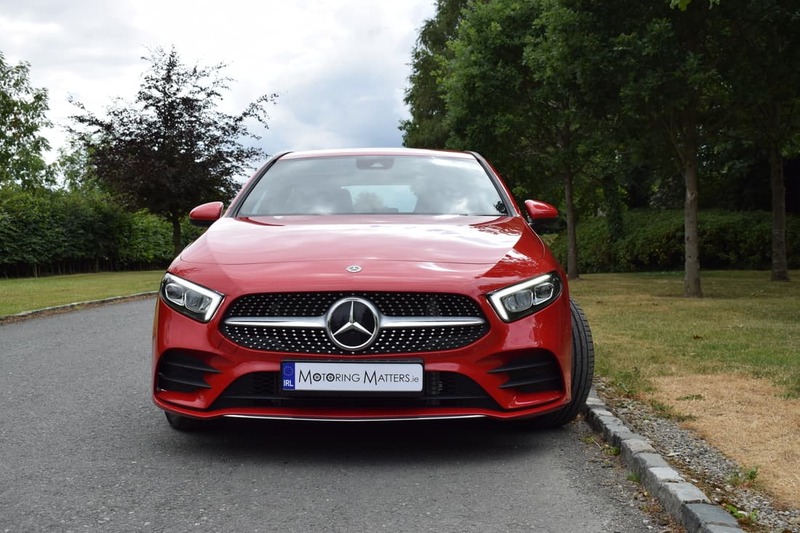 The wheelbase of the new A-Class has been extended by 30mm over its predecessor in order to accommodate all the new safety equipment and internal packaging. 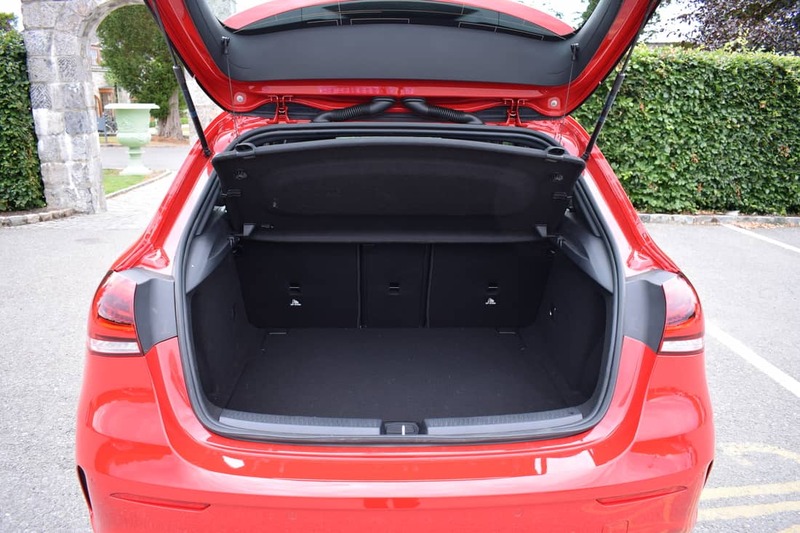 Rear headroom is improved over the old model too, and I found the car’s legroom to be more than adequate for this class of car. The interior of the new A-Class literally hugs occupants. Smooth transitions between instrument panel, centre console and door trims create the pleasant wrap-around effect. This is just as unique in this category as the selection of trim elements and indirect lighting to stage every detail perfectly. 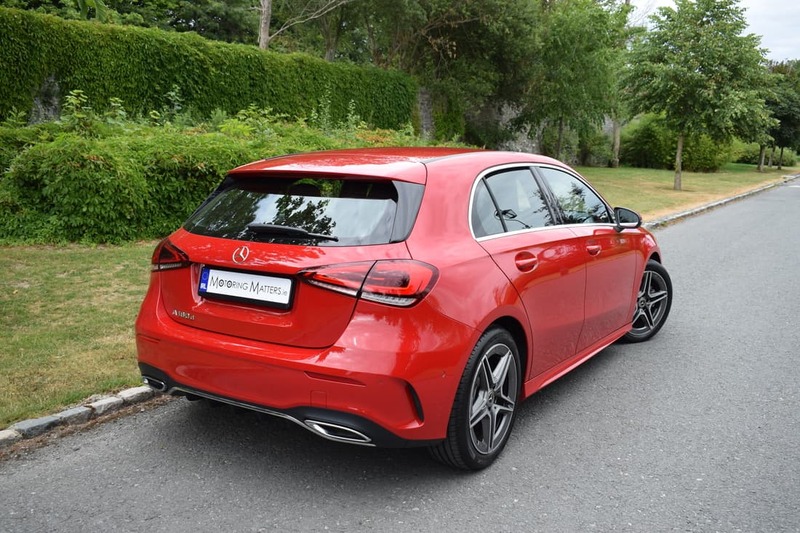 Overall, I found the all-new Mercedes-Benz A-Class to be an excellent premium hatchback, blessed with stunning design features, meticulous build quality and the very latest in cutting edge technology. My AMG Line test car really turned heads with its striking good looks and sporty appeal. Prices for the new A-Class start at just €31,600 (ex works), while the AMG Line specification models start at a reasonable €35,505 (ex works). PCP plans are available from just €345.95 per month on a 37 month contract.